One of the last subwoofers we looked at was the REL T-Zero. In fact, we looked at two of them. This year, the company subtly changed the T-Zero. So subtly you’d hardly notice at first glance. So subtly in fact that I didn’t notice the difference at first and got really stroppy about the magazine reviewing the same thing twice. Sometimes it pays to be at least a little bit observant. OK, I could be forgiven for having a bit of a hissy fit because from the outside at least there seems to be no difference between T-Zero and T-Zero V2. The cabinet is the same tiny little thing, available in glossy black or white, it sits on four feet, has a REL badge on the top, and some controls at the rear that look functionally identical to what went before. Closer inspection reveals the change to a down-firing 165mm long- throw alloy cone where before there was a doped paper cone. Otherwise, everything else is functionally identical, including the 100W Class D and the rear control panel. ► down to the way it’s connected. Where home cinema types will connect this to the LFE output of a multichannel amplifier, we go for the more high-level input, taking a feed direct from the loudspeaker terminals, and each REL is accompanied by a cable with a Neutrik connector at one end and three bare wires at the other. You plug the red wire into the right hand positive (red) speaker terminal, the yellow into the left hand positive (red) speaker terminal, and the black into one of the two negative black speaker terminals. If you want mono subs, you connect both red and yellow wires into the appropriate positive speaker terminal and black to the negative. We’d recommend two commoned mono subs instead of stereo, however. This is all fine and dandy… until you come across one of the increasing numbers of Class D amplifiers. Apparently, very few Class D designs reference the negative terminal to ground, instead using an approximate +15V reference instead. This doesn’t trouble the amp or the speakers but is not good practice when connecting up a powered subwoofer, as it can slowly cook the input stage of the sub, and more commonly cause hum. The way you get around this is to connect the red and yellow conductors as usual, leave the black unconnected (and taped up in case of accidental shorts) and then run a long RCA conductor from the LFE input of the REL to an unused amplifier input. This will create a ground for the REL. ► Here’s the thing with good subs; one is bass management, two are room correction. That holds here just as much as it does with some of the bigger designs. 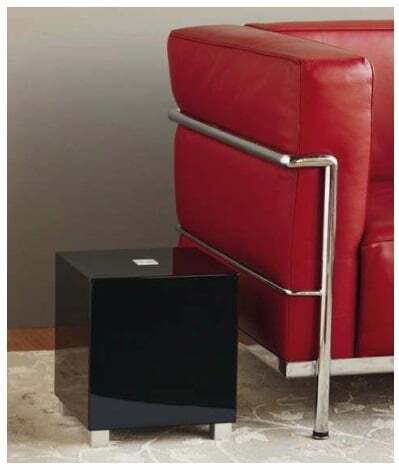 Of course, the level of both bass management and room correction is limited by the size of these subs, but although these are small, powered subwoofers, they are also benefitting from all the high- performance system integration and control you get from REL designs, albeit in a cube not much larger than an ice-bucket. Where this works in bass management terms is with something like a typical two-way stand-mount. That can be a fairly decent two-way stand-mount loudspeaker; the size of the driver and the volume of the cabinet are more important than the hole it makes in your wallet. But as a good rule of thumb, the bass driver in the loudspeaker probably shouldn’t dwarf the summed size of those inside the subs. REL has a page on its site for matching spekers to subs. If you are expecting bass management to mean ‘bass reinforcement’, however, guess again. 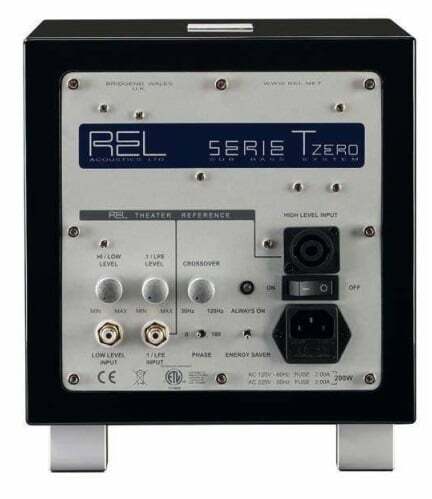 The point of the exercise is to use the two REL T-Zero V2 to make the bass of the loudspeaker to appear more linear, more controlled, and more precise… not to appear to have more bass, or even deeper bass. You’ll know the minute this is made right, as the midrange opens up and the bass gets cleaner and more accurate. Then there’s the whole room correction point. This is where two subs kick in. By adding a sense of control over the bass and taking the bass away from points where room nodes will dominate and overpower room and system, the subwoofers act to control the bass output in the room. This is akin to bass traps in the corners of the room soaking up bass. While not quite as effective as thick bass traps, and not as thorough as well-managed DSP correction, the reality is the two-REL package is a lot smaller than the first, a lot cheaper than the second, and a lot better than badly implemented versions of either. This is not magic, so don’t expect magical results. If a room has a terrible boom, the RELs will not treat it and the only ways to make good in such an acoustically vile chamber are the traditional treatment/DSP options. For a mild touch of bass control making the bottom end dry enough to tame a small amount of excess bass in a room, the REL option is a really good one, as it benefits the speaker system without changing their timbre or changing anything. In short, all upsides and no downsides, except for two more boxes. Of course, there’s a pretty obvious limit, and it’s the same one that applied to the original T-Zero. A 165mm bass unit, no matter how fast acting is never going to go really, really deep. Small might be fast and two smalls is faster than one big, but one big is still often deeper in the bass than two smalls. That stentorian underpinning that you get from full range loudspeakers won’t happen with a pair of small speakers and two T-Zero V2s, no matter how hard you try and convince yourself. If you turn them up, they do a fair job of convincing you that you are listening to a huge boom-box, but that isn’t the point of the T-Zero V2. This is The Little Sub That Could. The REL T-Zero V2 isn’t meant to be compared to the big guns, but in a way the small cones make them extremely fast, and that is a perfect foil for high performance audio systems. The size ultimately limits the ‘lift’ they can bring to some systems (you wouldn’t use the RELs with anything that has an eight-inch woofer or larger for example), but in adding some air and space and speed to a good thin floorstander or a regular two-way stand-mount without breaking the bank, a REL T-Zero V2 (or preferably, two) can’t be beaten.